Gate Entrance System - North Atlanta Fence & Gate Company, Inc.
Avoid any unknown vehicles from entering your property with an exceptionally beautiful driveway gate and operating system installed by North Atlanta Fence & Gate Company, Inc.! Simply click a button inside your car to open or close the gate without exiting your vehicle. Give your home or farm the look and feel of your very own private country estate with a beautiful driveway gate entrance system. 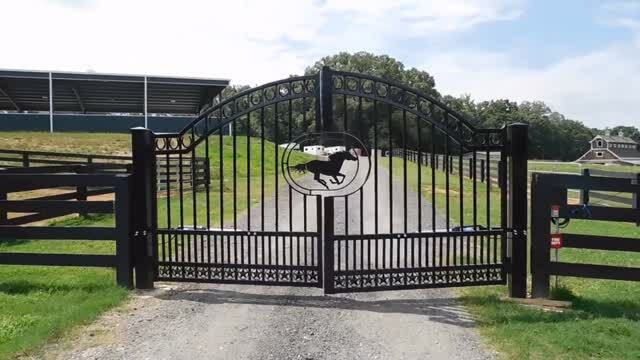 North Atlanta Fence & Gate Company installs Automatic Gate Openers, Automatic Gate Controls including gate remote controls and Steel or Wood Entrance Gates. Let us help you with your very own custom designed automatic driveway gate or property security gate. Keypad Pedestals are in ground and surface mount pedestals are designed to mount digital keypads, wireless intercom systems, and other access control devices. Digital Keypad with Intercoms are designed to your automated gate with the ability to "speak to" and "screen" visitors safely from inside your home. Ideal for securing gate entrances while providing controlled access. Digital Keypads are designed to allow access to your property for friends and family, and can be easily installed as a wireless system. The keypad is easily programmed with up to twenty-five different personal identification number (PIN) codes, with a re-programmable vacation code good for up to seven days. activates gate operator hands-free when vehicle exits the property. Available in 5 Watt and 10 Watt. If your gate system is located far from an AC power outlet (or greater than 1,000 feet) you can choose to charge your system with these high output solar panels.